A split nail can be painful, but you can repair it. 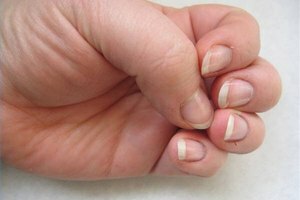 If you see a vertical line form in one of your nails, care for it properly before the split goes into the nail bed and causes a lot of pain. Clip a section of the silk nail wrap material a little bigger than your nail. The silk wraps come in long sections, roughly sized to fit the nails on different fingers. Fit the curve of your nail at the cuticle exactly. Trim the sides to fit. You can let it hang over the tip slightly. It can be trimmed or buffed off later. Rough up the entire surface of your split nail with the nail file. Leave the nail dust on your nail. This will help the silk wrap adhere better. Peel the silk wrap away from its backing and position it on the nail. Press it down into place. It's OK if it doesn't stick everywhere. You will fix that later after you apply the glue. Trim any excess off of the side, but leave any excess at the tip. Apply the nail glue to the silk wrap. A drop will spread out over the nail. Add as many drops as it takes to completely cover the silk wrap with glue, all the way to the tip. Press the silk wrap into place with the wooden stick. Roll the stick all over the surface of the nail to remove any bubbles. Dry the nail completely before continuing. Trim off the excess at the tip with either nail clippers or a nail file. Paint your nail with either a clear top coat or your favorite nail polish. A polish with nylon will help strengthen and extend the life of your wrap. Be careful when working with nail glue. It is easy to stick your fingers together accidentally. Use Nail Polish remover to unstick any stuck fingers. Do Hair Wraps Rot the Hair?